Dubai Industrial Park, one of the largest industrial hubs in Dubai and a member of TECOM Group, has launched a report titled ‘Global Food Trends to 2030: With a Closer Look at the GCC’ in collaboration with The Economist Intelligence Unit. The report, which the Park commissioned in an effort to contribute to the body of knowledge around the food manufacturing industry in the region, was launched in a special event on the sidelines of Gulfood on Monday, February 18, endorsed by the presence of Her Excellency Mariam Al Mehairi. 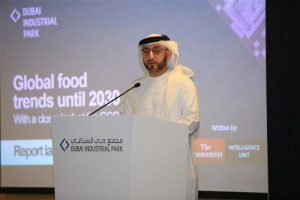 Saud Abu Al-Shawareb, Managing Director of Dubai Industrial Park presented key findings from the report, which identifies 20 global agri-food trends indicating the planet’s prospects for the future, and how this relates to the Gulf region, from the manufacturing stage to the supply chain. The release of the report reinforces Dubai Industrial Park’s continuous commitment to develop the industrial sector, from manufacturing to complementary logistics and trade in the UAE and to elevate Dubai’s position as a global hub for innovation-driven businesses in line with the Dubai Industrial Strategy 2030. The whitepaper highlights the ability of countries within the region to harness the technological advances of the Fourth Industrial Revolution to boost agricultural production, with the UAE leading the way. It also suggests that through leveraging its role as a significant trade hub, the region can position itself as a pioneer in fostering trade in sustainably sourced food with its associated economic benefits, and help reduce food supply risks at a time of increasing global trade uncertainty. The report calls for a full assessment of the economic, environmental and technological risks facing the Gulf region’s food system. Furthermore, it weighs the region’s challenges – including dependency on imports, reduced agricultural capacity and limited access to freshwater – against its opportunities and strengths, such as the emergence of technological advances in agriculture, high trade volumes flowing from Asia to Europe and Africa, and vice versa, as well as world-class ports equipped with state-of-the-art technologies. Commending the UAE’s efforts in the field, the document cites the example of a joint project of Dubai government-owned Emirates Flight Catering and US-based food production innovator Crop One to build the world’s largest vertical farm using hydroponics that can serve as a model for public-private partnerships in this space. The whitepaper features in-depth interviews with food experts, academics and senior food company executives from around the world, including the GCC region. Its case studies focus on food security challenges, environmental damage, health and nutrition, and opportunities that technology presents. Dubai Industrial Park, one of the largest industrial and manufacturing hubs in Dubai, provides state-of-the-art infrastructure and integrated solutions for businesses. The park hosts over 250 factories and over 700 business partners in sector-specific zones. Key business partners in the food and beverage sector include Al Barakah Dates, Barakat, Almarai, Patchi, Alshaya, Asmak, and Lulu. Dubai Industrial Park is a major contributor to strengthening Dubai’s status as a destination for international manufacturers and traders. Total industrial investment in Dubai Industrial Park reached AED 8.4 billion, while the investment in its infrastructure exceeded AED 4.7 billion since inception. Dubai Industrial Park is participating at Gulfood 2019 at stand CC7-10 in Concourse 2 at Dubai World Trade Centre from 17 to 21 February.